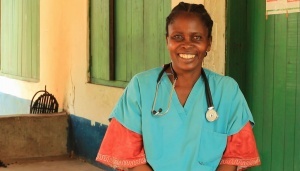 Last year, we learned about Anne Marie Magolo Zuku, a nurse at the IPOK Clinic near Gemena. She had attended a Medical Ambassador course called Bleeding After Birth which trains doctors and nurses how to manage bleeding complications after delivery. A PCP video told this story. On Sunday, April 19, 2016, a Medical Ambassadors team visited Anne Marie at IPOK again. 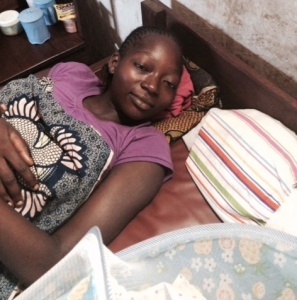 As we toured her medical center, we met a young mother and her two day old boy. The woman’s husband is a nurse at a NGO clinic that provides care for albinos. Anne Marie told us how she had to manage each of the three main complications that can cause bleeding after birth (the uterine muscle not contracting adequately, the placenta needing to be manually removed, and lacerations that need to be repaired) during this woman’s delivery. Anne Marie had involved the patient’s husband for help. As a team they gave the woman medications and administered intravenous fluid. Anne Marie manually removed the placenta and repaired lacerations. The husband was so impressed that he asked for a photocopy of her instruction book so he could learn the techniques Anne Marie had used to save his wife’s life. Anne Marie is an excellent nurse who loves God and applied the Medical Ambassador training she received to save lives. She loves to teach the training to others, and we hope sharing this technique with the patient’s husband will lead to more lives saved. I am honored to call her my friend and to have taught the Helping Mothers Survive course she attended two years ago. 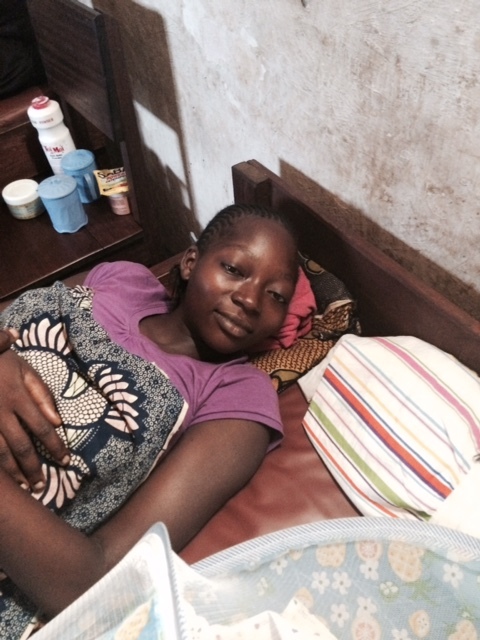 It is great that our family is able to support a clinic like Anne Marie’s through the Congo Clinic Initiative. Are you a nurse, doctor, health administrator, or currently in training to become one? Are you interesting in learning from other cultures? If so, consider volunteering as a PCP Medical Ambassador! PCP Medical Ambassadors are compassionate, dedicated medical professionals investing their skills in US-based service to Congo. We have developed an innovative structure to allow medical and healthcare professionals to work alongside their counterparts in DR-Congo. Our “training of the trainers” approach equips local personnel throughout the healthcare system of hospitals and clinics. The Medical Ambassadors are a critical link to transformed and saved lives. Contact Craig Anderson, our Director of Medical and Health Programs for more information about how to partner with us! Posted in Congo Clinic Initiative, Medical Ambassadors, Uncategorized.